The deal, which keeps Kucherov in Bolts blue while the team works to get its "cap house" in order, was signed just in time for Number-86 to be in the lineup for Thursday's season opener against the Detroit Red Wings. It's obviously a big win for Steve Yzerman's Lightning to get Kucherov under contract in time to start the 2016-17 season, especially when you consider that the palatable cap hit keeps the Lightning from being non-compliant. In a perfect world, Kucherov likely would have signed a long-term deal at a bigger cap hit; after all, it's not as though he's unproven in the eyes of the organization. But, Yzerman is forced to play the cards he's been dealt. 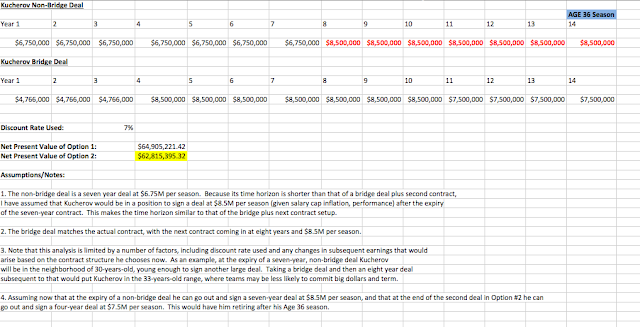 To keep the team on the right side of the salary cap line, Yzerman had no choice but to pursue a bridge deal. Kucherov, with little leverage, had virtually no choice but to accept. Beyond all that, the most important feature of this deal from the Lightning's perspective is likely the fact that Kucherov will remain a restricted free agent when it expires. Kucherov will have earned arbitration rights by then, but he won't be free to drive up his asking price using opposing teams as leverage. If Yzerman wasn't GM of the Year after the Stamkos deal, or after the Hedman deal, or after the Vasilevskiy deal, he must be now. As much of a bargain Kucherov's contract is, it's not like TB went for the jugular. Within shouting distance of low-range of a longer deal. Yes, it's true that the net present value of the bridge option falls short of the net present value of taking a long-term deal now. 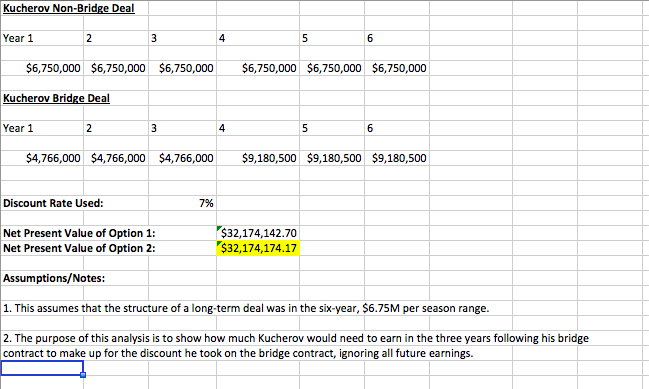 Given that he had little leverage, however, the cost to Kucherov is not particularly great. If you ignore the fact that he will likely make more on his next contract than $6.75M per season (i.e. 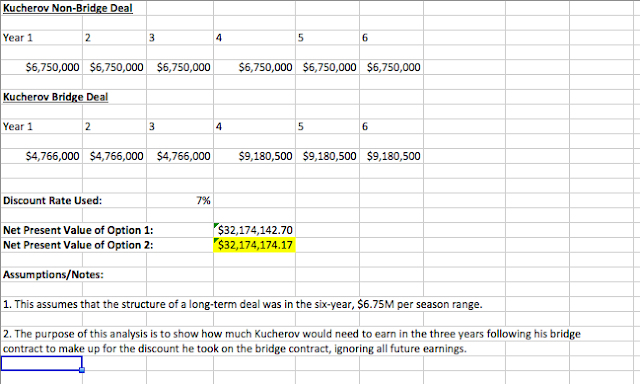 all things are equal following the six-year timeframe), Kucherov would need to earn $9.18M per season in years four, five, and six, to be in the same financial position. 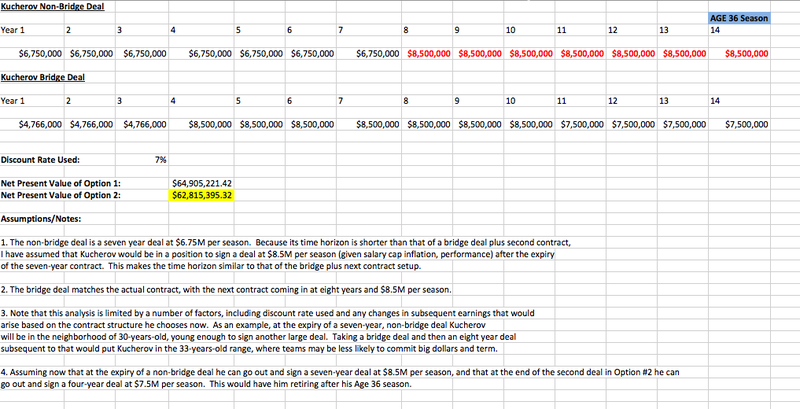 It's not an outrageous jump from the team's self-imposed contract max of $8.5M per season. The bottom line: This is a deal that will help the Lightning both on and off the ice for the next three years. And, while it probably wasn't the best case scenario for Kucherov, it's in no way grossly unfair to a player who had less leverage than American politics does sanity.